Greens member of the NSW Legislative Council, John Kaye, has previously stood up against privatisation of that state's electricity and we have published some speeches to that effect by him here at candobetter.net. Major newspapers carried quotes about his opposition to electricity privatisation and we publish here what he says on his website. I would like to take this opportunity to remind people that James Sinnamon, the owner of candobetter.net is a fierce opponent of privatisation and had intended to run as a candidate in the seat of Brisbane in the 2010 Federal Election on this issue. Unfortunately he was hospitalised for months after a terrible collision between his bicycle and a 4WD and so he never ran in an election where, ironically, he just might have won against the usual odds. We will write about this one day. NSW Greens leader John Kaye warns NSW Treasurer Eric Roozendaal that 'buying high, selling low' is not a winning formula. Analysis of the reporting of electricity privatisation initiatives in New South Wales brings disturbing confirmation that the major Australian newsmedia does not accurately report essential facts on issues of vital concern to us. Indeed, it often acts as a conduit for propaganda against our best interest. Contents: O'Farrell pilloried, Parliamentary debate ignored, Earlier misreporting: Iemma exhorted to ignore Labor conference, public will, What can be done about this?. See also: ABC gives free kick to Iemma, NSW electricity privatisation of 21 Jul 08. James Sinnamon, on behalf of Citizens Against Selling Telstra, urges NSW state Opposition members of Parliament to continue to hold the line against the privatisation of NSW's publicly owned electricity assets. What is the point of having an elected Parliament if they ignore the wishes of 79% of their electorate? See also: NSW electricity privatisation can be stopped!, Electricity Privatisation bill a test of whether the people or carpet-baggers rule NSW, Costa threatens MPs over electricity, Rallying against power privatisation, Democratic rights must be respected says State Independent candidate. 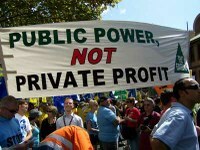 NSW electricity privatisation can be stopped! NSW Premier Morris Iemma has seized upon a limited and deficient Auditor-General's report (pdf, 354K) as grounds to proceed with electricity privatisation and plans to rush through the legislation next week. However, the sale has been consistently and overwhelmingly opposed by the NSW public and unions, and can be stopped. Read more about NSW electricity privatisation can be stopped! In spite of overwhelming opposition to the privatisation NSW Premier Morris Iemma engages in disruptive and and costly political stunt to 'position' NSW power assets for sell-off. When Barrie Unsworth complained on Sydney's local ABC radio of the New South Wales Labor Party's efforts to ensure that state Labor parliamentarians vote against the privatisation of NSW's electricity assets - a policy already rejected resoundingly by the electorate in 1999 and currently opposed by 79% of the NSW public - his interviewer Toni Matthews expresssed her total agreement with the former NSW Premier: "Why - It seems obvious to me - Why isn't it obvious to these younger members that you're talking about that they're creating mayhem within the party?" In a last ditch attempt to rescue NSW Treasurer Michael Costa's electricity privatisation push, the Rudd government has ignored Professor Ross Garnaut's opposition to compensating power stations for the costs of emissions trading, according to Greens NSW MP John Kaye. Garnaut to provide cover for privatisation of Snowy Hydro? Professor Ross Garnaut claimed in his Climate Change Review Draft Report that public ownership of the Snowy Mountains Hydro-electric Authority could restrict future development and competitiveness in the national electricity market. This appears to have been seized upon by Kevin Rudd as an excuse to privatise the Snowy Hydro in spite of the fact he promised before the 2007 elections to keep it in public hands. Read more about Garnaut to provide cover for privatisation of Snowy Hydro? NSW Treasurer Michael Costa's misleading attack on climate change reviewer Professor Ross Garnaut's emissions trading proposal is a last-ditch attempt to rescue the Iemma government's electricity privatisation push, according to Greens NSW MP John Kaye. The Taverner Research poll released today showed that a massive 79% of the poll sample rejected Electricity privatisation. This confirms that NSW voters have not been fooled by the Iemma government's power sell-off rhetoric, according to Greens NSW MP John Kaye. See also: SMH articles: Jittery Labor MPs get ready to dump Iemma of 29 Jun 08, Poll piles pressure on Iemma of 29 Jun 08, Poll adds to string of bad news for Iemma of 30 June 08. If NSW Treasurer Michael Costa can borrow in order to build transport, health and educational infrastructure, why can't he borrow in order to build electricity generation? John Kaye, Green member of the NSW Legislative Council urgently needs your support in order to force NSW Premier Morris Iemma and NSW Treasurer Michael Costa to honour their previous undertaking not to proceed with the sale of NSW's publicly-owned electricity assets without first putting the enabling legislation before the NSW Parliament. The ostensible argument for power privatisation is that NSW needs the money for schools, hospitals and other expenditure. The reality is that sale of capital is touted as the way to finance ongoing expenditure, analogous to the classic case of the farmer who sells off a bit of the farm each year to keep the family clothed and food on the table. SOONER or later, some anti-privatisation activist will start doing background checks on China Huaneng Group, which is at the front of the queue to bid for $15 billion in NSW power assets. They'll see that Sydney might soon be powered by the world's biggest corporate contributor to global warming. The NSW rural newpsaper the Northern Daily Leader of 9 May 08 reported local state Independent member for seat of Tamworth Peter Draper's observation that the NSW Government appeared totally impervious to public opinion on the privatisation of electricity assets. Paul Keating, although a financial consultant concerned with the sell-off of NSW's electricity assets, has displayed woeful ignorance of the reality of the NSW electricity sector according to John Kaye, NSW Greens MLA. When you take a public asset without permission and give it to private individuals, that is not 'reform' it is theft. Taking something without the owners' permission is stealing. The arrogant contempt in which democracy is held by many of Australia's political and business leaders and much of the newsmedia could not have been made more clear by the determination of the New South Wales Government of Morris Iemma to proceed with its plans to sell off publicly owned electricity assets. Community members held a no sell-off protest meeting outside key NSW Labor power broker and MP for Maroubra Michael Daley's office on 26 April 2008. Originally published here on 26 April 2008. 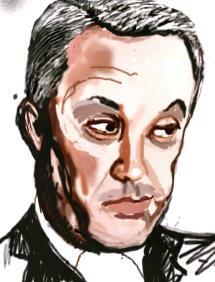 See also Party faithful boo Iemma in SMH of 3 May. This was posted to a discussion Time to give the b-team a turn, concerning the NSW Labor Government's bid to sell the publicly-owned electricity generators against the opposition of the union movement, the Labor Party and the NSW public. As further information comes to hand about the claims by The Australian Newspaper, they will be posted to this page. JUDGING by the Victorian experience, households and businesses in NSW can expect lower prices following electricity privatisation, together with more choice for consumers and fewer supply interruptions.